Thanks for the thorough review, Ian. In the meantime I extended the tool to also support internal gears and rack & pinion output. Profile shift is supported for all gear configurations as well. The underlying calculations are fairly fast even for higher quality modes and tooth counts. However, the rendering of the graphics is currently killing the performance. I am using the 3d webgl graphics engine that is embedded in the OpenJSCad framework. It is a powerful framework but overkill for rendering 2d graphics. Hopefully eventually I’ll find some time to replace it with a leaner and faster rendering solution. I really love your articles. I’ve been working in this business for about 5 years and I often visit to this website for the best insider news. Since the day I first visited your site I have been applying these insights, they have greatly improved my daily goals. Might you have any moreuseful insights? It was a really simple question asked by my mom that I had no idea how to answer. I am really excited about this nice tool. I did try to import the generated dxf file intot Autodesk Inventor but Inventor keeps generating an error message. Would you have any experience with this or any hints ? I was finding the same error with my AutoCAd products. I found that I can import the DXF file into SketchUp. Is this website only available to your students? I am trying to generate cad models for a machine concept I am working on at work. I searched and found the generator but I can’t see any input dialog boxes or update button. This would be a great tool to use if I could get access to it. I found this tool will not work with an I-pad but worked fine with my PC. What’s the best way to calculate the radius of the gears and the distance between centres of the two gears? This is amazing! I’m also having trouble importing the .dxf into Vectorworks and into illustrator (only imports as text). Is there some secret to using the DXF files that are produced? Just an update for anyone else trying to use illustrator or having issues importing into drawing programs. I downloaded Dassault draftsight, opened the dxf generated by this generator, then saved it as 2009, 2010 and 2013 dxf. 2009 and 2010 opened fine in illustrator. Brilliant! This is great! It has helped me a lot with my project. How is Profile Shift implemented in this builder? I am not interested in programming code, but in equations that make profile shift. I would be really grateful if somebody could recommende a book or a web link to this equations? Hi. When I take the following random values; a pitch of 10, then a pressure angle of 20°, then set the pinion and gear teeth both at 10, leaving all other parameters at zero, then generate a high quality DXF, then overlay the geometry on top of an involute generated in Excel from the basic involute equation, the two don’t overlay precisely. Would you have any idea why? For the data as mentioned, I have calculated the radius of the base circle as (10 * 10) / (2 * PI) * COS 20° , i.e. 14.955672 This is the value plugged into the Excel equation. Am I missing something? This is all new to me. Here’s the involute equation I used. I found that the dxf output file can be opened in Inkscape (freeware on al platforms) and then saved in any vector format (I use eps) Opening the file in Adobe Illustrator is an easy next step. Has anyone yet proved the output geometry to be true? The author hasn’t replied to my previous post. I still cannot get it to agree with my own results. I just want to know if this is reliable and if so, then I need to search further to find the fault in my own construction geometry. upon selecting generate dxf file it offers download dxf, but nothing happens when I select it. download from taking place, often download files from other web sites. Please try again in Chrome or Firefox. Both are confirmed to work. The tool itself is effin great! This is a superb online tool. However, I am having trouble generating a High resolution .dxf file for Internal Tooth Spur Gears. The only resolution I can get is Draft resolution. If you have a solution to this, that would be great. I may also be doing something incorrect. I have no problems importing the .dxf into my PC’s Turbocad 11.2. My Turbocad version does NOT do Internal Tooth Spur Gears. And thanks again for the great tool. Particularly the first one is relevant and gives you more control over the desired quality. Increase the value slowly since the calculation time increases non-linearly with larger values. And, even in Draft mode, I can only zoom in to the point that the gear is the size of pea in the middle of the viewing window. It would be great if we could just set Inch/Metric Module (much more intuitive/normal) instead of using Circular Pitch. This seems to work better with huge-sized gear inputs, not small gears. This is the most promising Involute generator I’ve found on the web so far, but it’s not quite done. 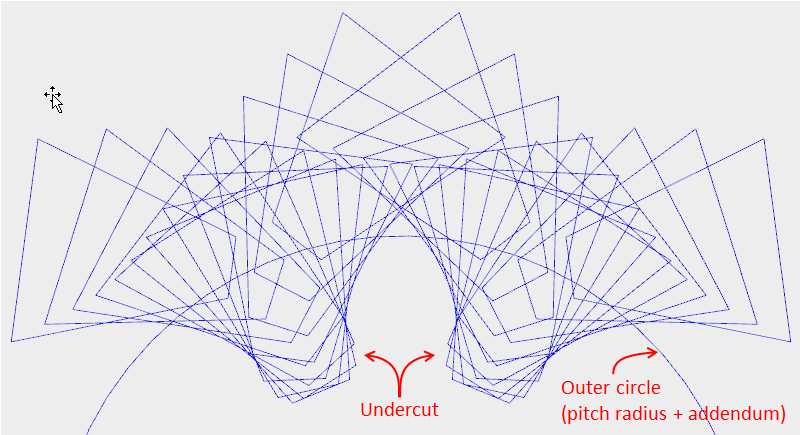 The first value is the circular pitch (i.e., the circumference of the pitch circle divided by the number of teeth) in mm. Based on your values the diameter of your gear is 0.375 mm or 0.0147″. Also, it makes me a bit nervous that the DXF file is named “CycloidalGear_1.dxf” and not Involute…two very different things…are we sure that this is an Involute profile and not a Cycloid? I fixed the file name. It now reads ‘InvoluteGear_1.dxf’. Make sure that you refresh the page (typically Ctrl+R or Ctrl+F5) to update to the new version of the script. Yes, I am sure that the generated output is an involute gear. 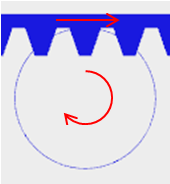 Cycloidal gears look very different (see e.g., http://www.hessmer.org/blog/2013/12/29/online-cycloidal-gear-builder/). Error: Area is not closed! I tried it with the following parameters which worked for me. Can you try again and if you get stuck, send me the complete set of parameter values you use for the -70 gear? This is a very well structured website. You really need to create more new content, I am sure a lot of people use this website to find the latest insider insights in this industry. In my view, if all webmasters and bloggers made just right content material as you did, the web might be a lot more helpful than ever before. A close friend of mine recently shared with me your blog and I find it to be an excellent resource for my job. This post really made me think about things. That was a really simple question asked by my friend that I had no idea how to answer. Do you have any plans to add SVG output? The code heavily relies on OpenJsCad/csg.js which only supports dxf output. You can however, import the generated dxf file into Inkscape and then save it as svg. I have been using your application to generate gear profiles for a wooden clock – these will be milled via Cut2D (Vectric). The dxf files import faultlessly into Cut2D – this is great stuff!! I also tried to import into Autosketch in order to add crossing out detail to the gears. Unfortunately this gives an error message “Table flags missing on line 32.”. Not being an expert in DXF file syntax, I have no idea how to fix this. Are you able to offer any suggestions as to how to correct/change the file. DXF’s generated in Autosketch do import correctly into Cut3D. You might be able to work around Autosketch import by first importing the dxf file into Inkscape (free) and then exporting it in a format that Autosketch understands. Thank you for that guidance – Inkscape solved the problem completely. What an awesome piece of software that is – and all for free as well. I really must take the time to learn to use it effectively. I must say a thanks too for the gear profile generators – just what a hobbyist need for fun projects. I can not get a DXF file without an error for the External Spur Gear Generator. Love the program. Its brilliant but I must be doing something wrong. Last two values tried 10 and 90 but did not work even 3 and 30 did not work. I see the image and it appears to be generating the correct graphics. What browser do you use? If possible switch to Chrome. I confirmed that your values work. I want to thank you for this gear generator. I spent the better part of a couple of days learning everything about gear design and the math behind it for some wooden gears and locking mechanism (rack & pinion setup) I was commissioned to make for a client who’s got a closet for his Batman suit and weapons (no, I’m not kidding it’s a fully wearable Batman suit). Then sometime last night while taking a coffee break, found this generator and it gave me exactly what I needed!! It took me a minute to figure out the measurements to input were in mm and not inches and kept getting strange things, so maybe add in a note or something. Downloaded the DXF into TurboCAD (no issues at all) and then into illustrator (also into AutoCAD just to check) and from there into my CNC programs (ArtCAM8 Pro and MACH3). Will be cutting them out later, but thanks again for saving my bacon. Doug, this is very exciting. No, I don’t object at all – on the contrary. 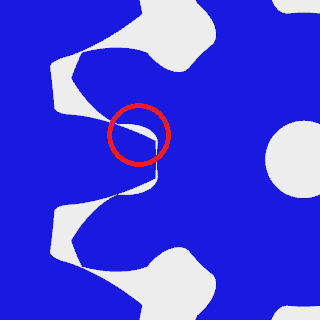 I noticed that there are some jagged lines in the gears, even with 10 step/tooth and high resolutions. 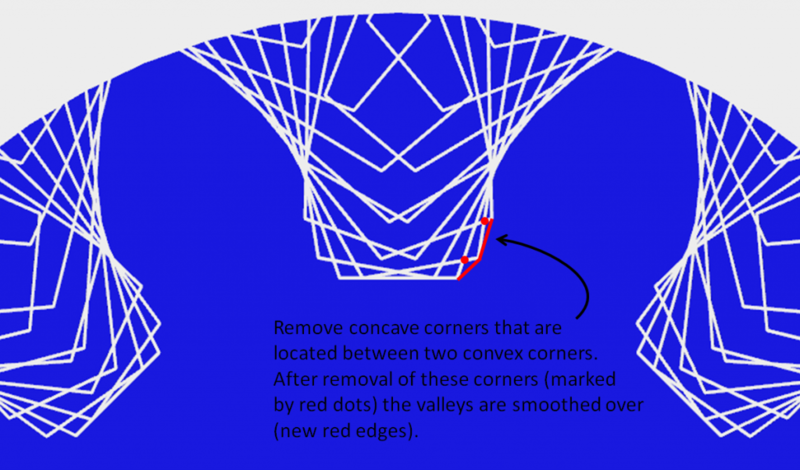 I found that running _smoothConcaveCorners one additional time removed the artifacts. I’m trying to generate a planetary gear with -240 teeth but the builder ‘s script blocks ! I genarated with the same builder last june other planetary gears with 360 teeth without any problem … What’s wrong ? You might need to zoom out to see the generated gear set. I tested by leaving the default values for all but wheel 1 tooth count which I set to -240. After a while the gear set is generated but nothing is displayed. Once I zoomed out the gears showed. We’ve got a feature request for you to think about, please. We love Gear Builder, thank you. Here’s an example of where we used it: http://sheetcnc.co.uk/strandkrab/ These toys will be heading to Maker Faire UK in a couple of weeks. The gears of this and many of our other projects were designed on Gear Builder. So thank you! The StrandKRAB gears are CNC’d, which means they naturally have a radius at the bottom of the teeth. This radius can foul the tips of the meshing teeth. To prevent fouling we could instruct the CAM to overcut the corners, but this causes sideways cutting and results in very weak roots. Alternatively we can increase the clearance setting in Gear Builder. Increasing the clearance moves the radius deeper into the wheel where it won’t foul anything. Which is great… but we don’t really know how much clearance we should add. It’d be nice if Gear Builder could take our cutter CED as input and then compensate with additional clearance automatically in the designed wheel. Does that sound worth doing? I am happy that you found Gear Builder useful and I am really impressed by your strandKRAB and StrandSiameseKAT. In the past I used regular CAD software to add two cut-out circles at both sides of the valley between two teeth to make the gear cuttable with a given end mill diameter. I then created duplicated cut-out circles for each tooth by rotating the original two circles around the center of the wheel. The two circles effectively represent the dog-bone approach (http://blog.inventables.com/2014/06/learn-about-milling-inside-corner.html). While I like the idea of automating this in the gear builder I am afraid I won’t have time. articles from other authors and use something from other web sites. I want to use the gear module, which is not part of your parameters. I tried to make a gear module 2 with 1 wheel 24 teeth and one wheel 8 teeth. I entered that value and expected 2 wheels 24 and 8 teeth with a center distance of 32mm. But when I cut the file out of wood, I always got 30mm. So the wheels are around 7% smaller and the module is not the standard module of 2. I am not sure where this scaling error comes from. I tried different DXF import tools and all show the same effect. What value of “circular pitch” is correct when I want to make a wheel with a module of 2 ? Your calculations are correct and my program yields the same results. 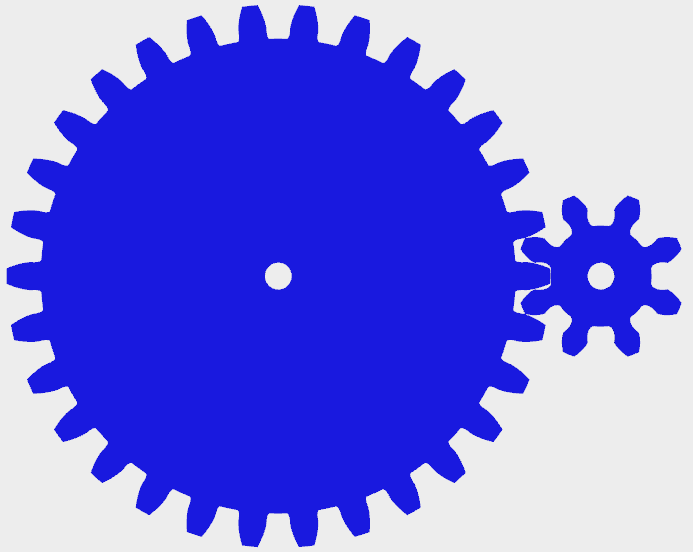 You can see it if you print out the generated dxf file (I used Inkscape) and then measure the distance between the two gears. Could it be that you cut out the gears with a 2mm bit and your cnc path does not take the required 1mm offset for cutting into account? I used a Laser cutter, so the maximum tool gap was 0.1mm. I did the same test again now, and suddenly the dimensions are right. No idea where this came from. Really loads of excellent advice dating a single mom ! Really a good deal of terrific facts meet indian singles ! Great data, Many thanks single people meet! Excellent tool, but when I try internal gears they don’t mesh. Is there a way to advance a gear to bring them into sync? Can you provide the parameters that you used? I tried with a few combinations of n1 / n2 tooth counts and did not see a case when the gears did not mesh. this blog contains amazing and genuinely fine stuff in support of visitors. Thanks for the marvelous posting! I quite enjoyed reading it, you happen to be a great author. may come back later in life. I want to encourage you to ultimately continue your great work, have a nice weekend! Thank you. I like your code, a lot. It’s the only one I have found with clearance, backslash and profile shift, which are very usufull if you try to make a 3D print. Add one vote to the module option. – When I tryed to obtain the dxf of a 135 internal gear (parameters: 3.1416, 20, 0.1, 0.1, 0, -135, 0, -, -, Wheel 1, 6, 30. Specifically 6 rotation steeps, it gives an error: Area it’s not closed. – For that same profile, I think that with rotating steps higer than 3 (I tryed 8, 5, 4 and 3) the profile has a problem: it kinds of deviates from a smooht line. – I also think that the clearance and backslash doesn’t work for the internal gear, at the bottom of the tooth. I used the profile shift to obtain a little clearance.